ESPEC Qualmark has been the leading expert in reliability testing equipment since the company premiered the technology in the early 1990s. 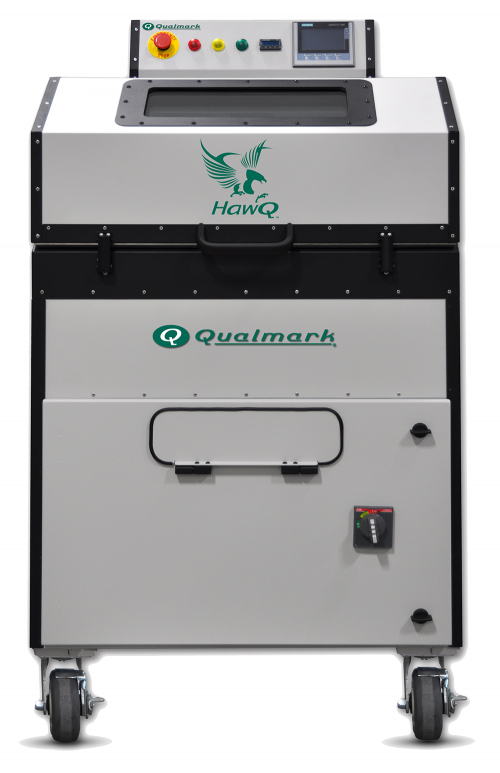 Qualmark Highly Accelerated Life Testing (HALT) & Highly Accelerated Stress Screening (HASS) chambers are unique, accelerated product reliability test methods focused on finding defects in products so they can be fixed before becoming expensive field issues. HALT and HASS, collectively referred to as Accelerated Stress Testing (AST), subject a product to a series of over stresses, effectively forcing product weak links to emerge by accelerating fatigue. Unlike traditional single axis vibration test methods or thermal only methods, an AST program requires specialized HALT/HASS equipment to render the required stresses – random six-degree-of-freedom vibration and rapid thermal change rates – in the combined environment necessary to drive out latent failure modes. In HALT and HASS chambers, stresses are applied in a controlled, incremental fashion while the unit under test is continuously monitored for failures. Once the weaknesses of the product are uncovered and corrective actions taken, the limits of the product are clearly understood and the operating margins have been extended as far as possible. Result? A much more mature product can be introduced much more quickly with a higher degree of reliability. We have partnered with Qualmark, who are worldwide leaders within the field of HALT / HASS, to offer a full and comprehensive range of chambers specifically designed to cope with HALT / HASS testing. Thousands of companies embrace combined environment accelerated testing that includes vibration (typically on an ED Shaker) and thermal testing, to rapidly improve the reliability of their electronic product designs. Conducting this practice early is most beneficial, as reliability can most easily be improved early in the development process. Qualmark’s new Portable Rapid Testing System takes this to a whole new level. HawQ preys on and exposes failure points, and screams through thermal testing in a fraction of the time of traditional thermal chambers. 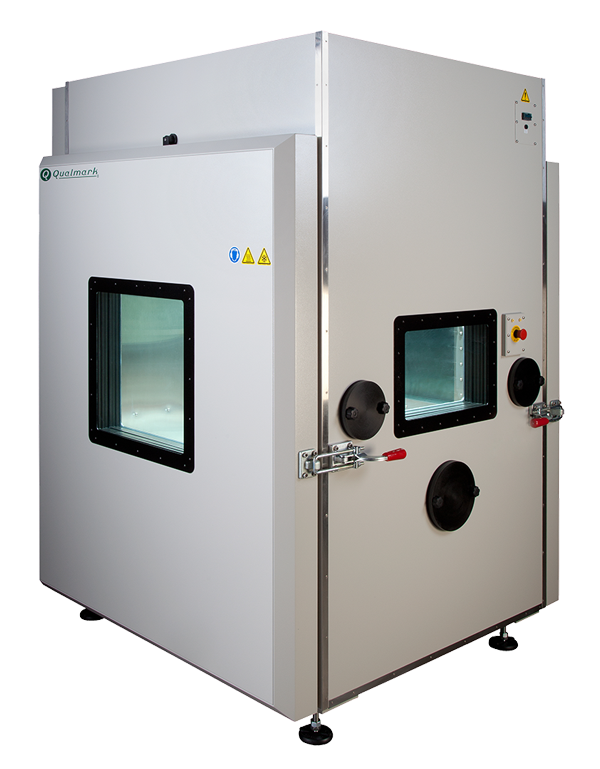 This leading edge system allows you to conduct rapid testing with thermal change rates of 40°C/min from -100 to +200°C! 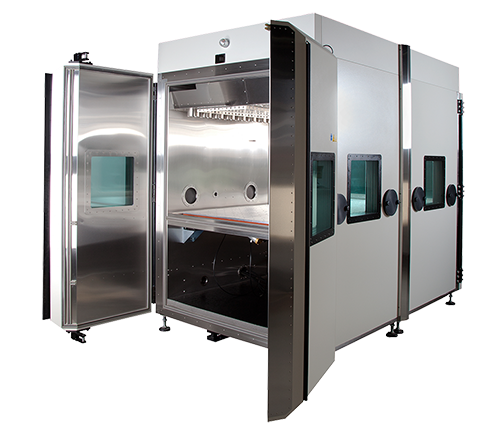 By maximizing the thermal cycles performed in 24 hours, you slash your testing time! Time is money, and HawQ will help you save it! But not just that, HawQ also delivers Six Degree of Freedom vibration at the simple push of a button. By utilizing the ultimate combined environment of rapid thermal changes plus vibration, your designs will fly through reliability testing. HawQ is a cost effective, portable solution that is available for purchase or lease to utilize in, or near, product development groups. The Portable Rapid Testing System provides an easy to use solution with Ethernet/WiFi options to allow for remote monitoring by development teams, and is a quiet, vibration-isolated system for virtually all development teams, R&D, Reliability, and University Labs. The OVTT, OmniAxial Vibration Table Top, series introduced the first stand-alone, compact, repetitive-shock vibration system on the market and features Qualmark’s patended six-degree-of-freedom vibration technology. The OVTT 24 system provides 77% more table surface area than the OVTT 18 which makes it an ideal tool for in-production-line, broadband spectrum vibration testing of product. It is also ideal for quick evaluation of field returns, repair verification and random vibration testing of multiple small products and can be configured for placement inside a thermal chamber for combined stress tests. For more information please have a look at the product datasheet. The Typhoon 1.5 – 2.0, with its 18″ x 18″ & 24″ x 24″ vibration table are perfect for performing Highly Accelerated Life Testing (HALT) on small products, or where limited lab space is available. This compact system is built using Qualmark’s Typhoon system technology which delivers impressive thermal performance and six-degree-of-freedom repetitive-shock vibration. The Typhoon 2.0 is a practical addition to any company’s product reliability program. 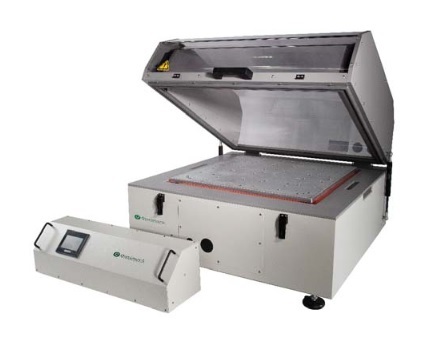 The Typhoon 3.0 is specifically designed to help the customer who is performing low volume Highly Accelerated Stress Screens (HASS) and needs a chamber with a 36″ x 36″ vibration table. It is also ideal for performing Highly Accelerated Life Tests (HALT) on mide-sized and larger products. Like our Typhoon 4.0, the Typhoon 3.0 vibration table mounts at two different heights, so the interior chamber volume can be adjusted for the needs of the product. This system is designed specifically for the task of performing Highly Accelerated Stress Screening (HASS) and Highly Accelerated Life Test (HALT) on large products. Its 48″ x 48″ vibration table is capable of supporting hundreds of pounds of products, fixturing and mounts at two different heights. The Typhoon 4.0 provides optimal thermal and vibration performance to drive out failures fast, yet is amazingly quiet. 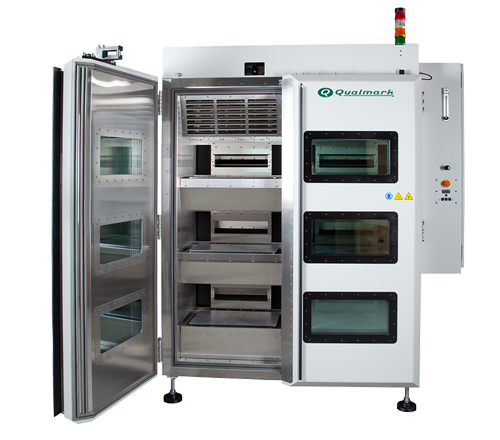 Qualmark’s Inferno series has been specifically designed for accelerated testing for devices that are destined for harsh operating environments (+250°C to – 100°C). The Typhoon 8.0 doubles the table size of our popular Typhoon 4.0 chamber. The thermal system in the Typhoon series has been carefully engineered to have superior thermal efficiency. Key design elements such as our patented blower technology, highly efficient air flow characteristics and careful choice of materials have combined to keep liquid nitrogen and electricity costs down without compromising our industry standard thermal performance. 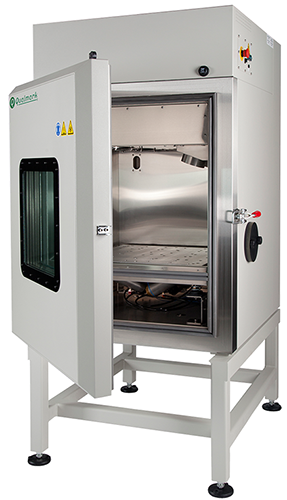 The Typhoon 8.0 has the largest vibration table available in HALT/HASS chamber. 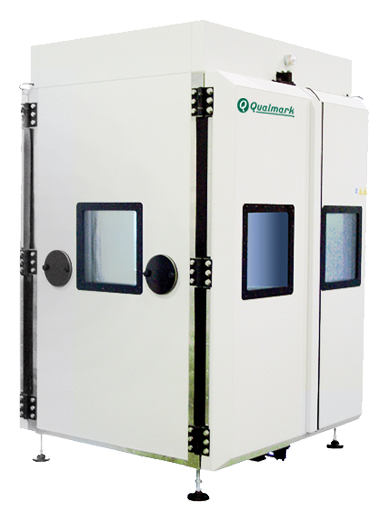 Qualmark’s QFusion represents the latest in accelerated stress test technology – specifically addressing the reliability testing needs during production. This system is designed to perform HASS/HASA (Highly Accelerated Stress Screen/Highly Accelerated Stress Audit) and/or Burn-In on product to locate failure modes that may have been inadvertently introduced during manufacturing. QFusion technology provides maximum performance for driving out process-induced faults and detecting inferior component substitutions that could otherwise turn up in the field as costly failures. 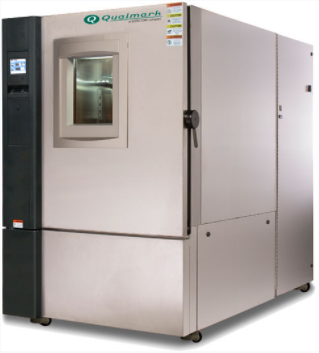 QFusion’s combined environment (thermal and random shock vibration) and 6 table configuration accelerates process verification and for less cost than with traditional equipment. Qualmark’s compressor based HALT system will bring a whole new level of accessibility and achievability to customers and locations where traditional HALT systems just are not feasible. Whether LN2 is difficult or too costly to attain and maintain, or the infrastructure just does not allow for LN2, this is your answer. Likewise, this new system serves customers who want the LN2 boost for testing and achieving increased thermal ramps, but perhaps don’t need it all the time for all testing . In those interim times, the mechanical refrigeration system can be used for a multitude of basic HALT tests with a temperature range of -70 to 180°C and temperature change rates as high as 15°C/min. The random shock vibration table provides the complete combined environment needed for HALT testing. This is a robust system built on the proven, quality technologies from ESPEC and Qualmark, so you know you are investing in the best.